My dad's just bought the last potatoes in Tesco. Look what mayhem #Ophelia is causing. THERE’S NO DOUBT that everybody got a little bit more concerned about today’s weather forecast when Dunnes Stores announced that they would not be opening any stores today. Nothing quite captured the gravity of #Ophelia for my mother like Dunnes closing nationally. 20 minutes of commentary on Dunnes so far. Even before this announcement was made plenty of customers were going into doomsday mode in Tesco stores from Limerick to Dundrum. Pray for the Tesco staff who are due to work today despite recommendations from Retail Excellence who are particularly concerned about the fact that some car insurance policies don’t cover driving in status red conditions. Retailers calling whether to open tomorrow. Our advice is Close All Stores. Some car insurance policies do not cover driving in Status Red. The queues were dreadful. This is like a horror film for people who hate doing their shopping. What does everybody plan to do with all of that bread? Apparently when disaster strikes in Ireland everybody’s first instinct is to grab a sliced pan. Naturally, they aren’t expecting to sell many trampolines in this weather. If you’re lucky enough to have the opportunity to stay home today, make the most of it and avoid heading out on a random shopping trip if possible. Email “There were absolute scenes in Tesco stores around the country last night ”. 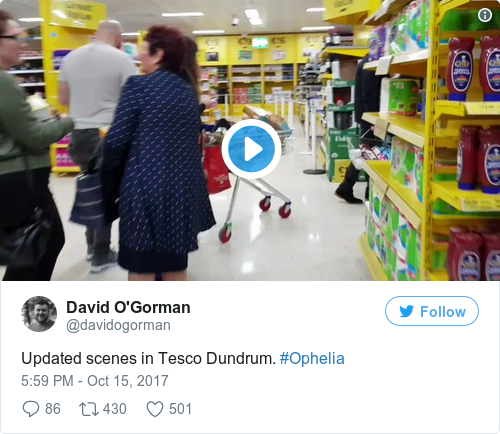 Feedback on “There were absolute scenes in Tesco stores around the country last night ”.